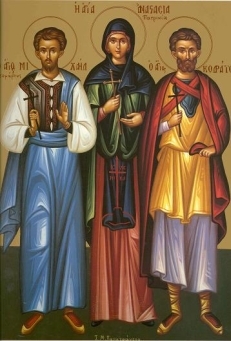 March 10 marks the feast day of a third century martyr named Kodratos, a Christian poorly known today but evidently important for the church communities of Late Antique and Byzantine Corinth. This Kodratos (aka Codratus / Quadratus) is not to be confused with the famous Kodratos of Athens, the bishop and apologist of the second century. The information available on the internet about Kodratos of Corinth is remarkably slim. The wikipedia article notes only that he “was a hermit and healer who was martyred at Corinth with his friends Cyprian, Dionysius, Anectus, Paul and Crescens.” This is not much more than we find in the Synaxarion as well as in today’s note from the website of the Greek Orthodox Archdiocese of America: “these martyrs contested for piety’s sake in Corinth during the reign of the Emperor Valerian (253-260).” I found a short summary of his life and martyrdom here and a slightly longer version here. His life is also treated briefly in Engel’s Roman Corinth and Vasiliki Limberis’ “Ecclesiastical Ambiguities: Corinth in the Fourth and Fifth Centuries” (in Urban Religion in Roman Corinth), which summarizes the account in the Menologion. ﻿ A couple of years ago, I managed to convince friends, colleagues, and students from Messiah College’s spring Latin Lunch reading group to plow through a version of the life of Kodratos. It’s a late version by the 14th century Byzantine intellectual Nikephoros Gregoras, a man impressive for his breadth of interest: a history of the Roman state of his own day, astronomical treatises, commentaries on Homer, among others. A copy of Gregoras’ manuscript ended up in Bavaria, where it was translated into Latin by a Jesuit named Reinold Dehnius. As a Latin text translated from the Greek, it was not easy reading. Someday perhaps, I’ll post a complete translation, but for now, I only have time for this brief paraphrase. Kodratos was born on the Isthmus famous for its pleasures and opulence and to noble family with Christian parents who practiced virtue. He had chance to enjoy neither for long. While still an infant, his mother died and then his father, and he was loosened from the bonds of nature. Destitute of resources, his hope now lay in the Lord alone who raised the boy in a marvelous manner, nourishing him in the fields as He once did John the Baptist in the desert. Taken care of in this way, he grew in grace and wisdom, and all sorts of miracles surrounded him daily. Not unlike the Israelites in their flight from Egypt, God provided for him, accompanying him in clouds and light. Of garments and clothing and the sorts of things which bring comfort to the body, he had no need, for he lived the life of a man of the country and mountains. When he reached a mature age, he descended from his mountain, went down to the city, and began to converse with men, serving out divine oracles as food. He smelled like the country, ever fruitful, like one blessed by the Lord. The people hung on to every word of his mouth, not unlike the Israelites listening to Moses, the contemplative. A small group of like-minded sojourners joined him in his way of life, at one moment heading out to the country, at another returning to the city. His stays in the country grew longer, his time in the city shorter. Prudently he fled the crowd and henceforth devoted his whole course of life to divine conversation. At this point, when the emperor Decius had gained control of the state and Jason was proconsul, they spread their wicked dogma, and the Christians willingly undertook danger. Here divine Kodratos excelled before all others, as did his friends and comrades in their way of life, training their bodies as athletes for the great contest. Led in chains before Jason, he addressed the governor with strong words: ‘Whence, o wicked head, does your great wrath move against Christ and us, his servants?’ Threatened with torture, Kodratos promises he will endure sword, fire, flood, and any other device. “Bring it on!” [as one colleague of mine put this line: adhibe nobis omnia!]. Tortured in nasty ways, he encourages his companions to die in Christ. Dragged through the city, these athletes of Christ were at last taken out of the city and decapitated. Their blood fell on a stone which sprung a fountain of water that survives even into our own time and which has been a cure for main illnesses and ailments. Pious men gathered their remains and built a church on the spot.